Genghis Khan (A.K.A Chingis-Khan, 1162 – 1227), born Temujin, was the founder and Great Khan (emperor) of the Mongol Empire, which became the largest contiguous empire in history after his demise. Without the vision of a goal, a man cannot manage his own life, much less the lives of others. If you're afraid – don't do it, – if you're doing it – don't be afraid! When it was wet, we bore the wet together, when it was cold, we bore the cold together. I hate luxury. I exercise moderation… It will be easy to forget your vision and purpose once you have fine clothes, fast horses and beautiful women. In which case, you will be no better than a slave, and you will surely lose everything. No friend is better than your own wise heart! no one is more reliable than yourself. Although many people can be your helper, no one should be closer to you than your own consciousness. no one is more valuable than your own life. Pride is more difficult to subdue than a wild lion. 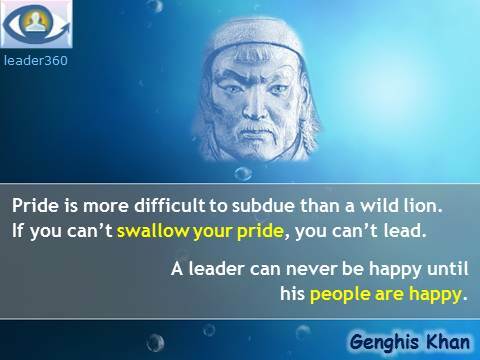 If you can’t swallow your pride, you can’t lead. the teaching of the elders. The old tunic fits better and it always more comfortable; it survives the hardships of the bush while the new or untried tunic is quickly torn. is an action doomed to failure. it is dismounting and governing that is hard. People conquered on different sides of the lake should be ruled on different sides of the lake. In the space of seven years I have succeeded in accomplishing a great work and uniting the whole world in one Empire. but do not let my country die.